Time now for some haute chocolate! While edible undies are really nothing more than Fruit Roll-Ups, this magnificent outfit is made for the fashionista gourmet! 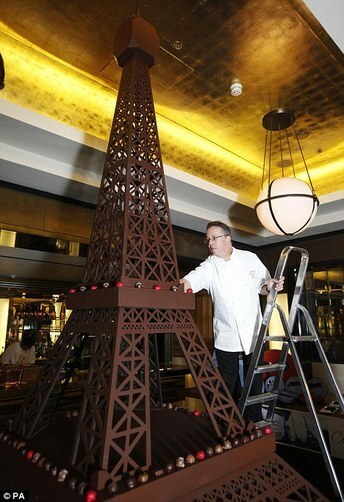 “Commuters rushing to catch their trains at London’s St. Pancras International Station were in for a treat that made most of them drool – A 12-ft high replica of the famous Parisian landmark – The Eiffel Tower. If you could make your own clothing out of chocolate, what would you make? Where would you wear it?